DC Metro Church is about eight years old, having launched in a movie theatre in 2007. Pastor David Stine is our lead pastor, and his vision is to rebuild the spiritual walls around the DC Metro area. We have a vision for 17 campuses around the DC Metro area (we currently have three) and three more in New York (pending). All of our sites are co-equal; there is no main site or main campus. We have a central staff and then campus staff separately. I am the IT guy for all our sites; we have one main audio person, one main lighting person, and eventually we will have more staff at the campus level, but for now keeping things centralized keeps things organized. We currently have 35 people on staff. Our average weekend attendance is roughly 3000; we run a contemporary non-denominational worship. As a church staff member who wears multiple hats, Bushel – a cloud-based Mobile Device Management (MDM) solution for iPads, iPhones, and Mac devices in the workplace – became a necessity for me. There was not always enough time to give our computers the attention they needed, and many times I wouldn’t ﬁnd out that we needed an update or a new piece of software until a staff member was pounding on my door saying they needed something updated. I was able to install the Bushel proﬁle on our 30 different Mac computers (Mac Books, iMacs, Mac minis and iPads), and it now automatically lets me know the basics of the machine – from the serial number to the build date; the operating system it’s using and if an update is needed, etc. and has seriously saved me for inventory management. We haven’t started using it for phones yet, but plan to. All our staff computers and tablets, are owned and managed by the church, which means the responsibility for upkeep and upgrading is our responsibility as well. Therefore, it’s very important for me and my team to know the condition of the devices on the software end of things. Our users are all standard users, but my tech team and me are the administrators, and very little can get updated or installed unless we do it. Prior to Bushel, the end user would just keep on using their system with an IT issue until it absolutely didn’t work anymore, at which point in time I was ﬁxing ten things instead of just one. The Bushel software allows me to access the info I need about all our computers; I can lock devices if they get lost, I can erase a device if necessary, etc. However, to run updates I need to have the device in hand. This is easy to manage, because when I log into Bushel, I see a screen of all my devices and if any of them aren’t conﬁgured a certain way or need to be updated, a red exclamation mark appears beside that device so I know it needs work done. Additionally, there are features for setting up and assigning email accounts through Bushel. Bushel can support several email options, such as Exchange, Gmail, and IMAP/POP accounts. Using our mail server, we can assign a certain device an individual email account and maintain it to make sure our staff doesn’t have any issues. Initially, we bought this product because I needed an inexpensive way to track our assets – I had a lot of requests coming from our accounting department for information regarding our devices. They needed to know the age of them, the current condition, etc., and keeping track of the machines in order to do this was time consuming. With Bushel, there are Asset tags that allow me to track each machine, and provides a .csv that contains all the information the accounting department needs. Once I got into the program, I saw all the added beneﬁ ts that would help me as an IT manager – allowing me to see the capacities of each machine, from the storage on the device vs our cloud storage, to updates needed. Something we haven’t started using heavily yet is that we can do managed apps via Bushel. This means I can purchase an app through our volume purchasing program license and push them out to all of the devices that need it at the same time. This leaves the ownership of the app in the hands of the church; if it’s a more technical app, I can assign it to a technical users, and can also pull an app and reassign it if the computer changes hands, or gets replaced. It also means that for people that have their own cell phone but allows us to manage it, I can manage the ‘business’ apps on their phone. And, because we retain the software and the licensing, I can easily track apps from both a ﬁ nancial and legal standpoint. 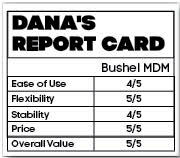 Overall Bushel is about stewardship for us, it allows us to track, delegate, and assess the condition of our IT equipment, and software, from on central location. The cost structure is simple and predictable when adding new devices and allows us to plan with the growth of the organization. There are many bells and whistles that are left out from the enterprise level programs, but they make up for it in the ease of use for the general IT manager.